* develop recommendations on how to tailor sulfur dioxide and ascorbic acid use based on wine compositional parameters. Wine Australia Chief Executive Officer Andreas Clark said, “We are delighted to partner with the National Wine and Grape Industry Centre to deliver some outstanding practical tools and outcomes for our sector over the next five years. 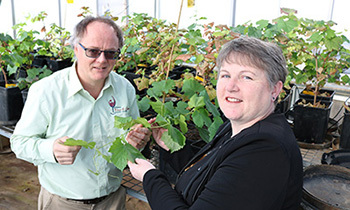 NWGIC Director, Professor Leigh Schmidtke, said, “This research is based on meeting the needs of industry and aims to deliver practical information and innovation to make Australia’s wine industry more profitable and sustainable to support thriving rural communities”. Photo: Director of the NWGIC at CSU Professor Leigh Schmidtke and CSU Deputy Vice-Chancellor (Research, Development and Industry) Professor Mary Kelly.